Based in far west NSW, Advanced Profile Solutions uses state-of-the-art technology to manufacture precise components used in the mining industry. Mining companies rely on innovative manufacturing and support industries to maintain their competitive edge. In NSW, these industries have become skilled at tailoring unique requirements for miners that often do not have off-the-shelf solutions. Based in Broken Hill, Advanced Profile Solutions cuts and drills metal plates for engineering firms in the mining industry. 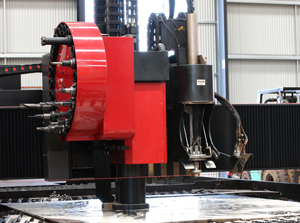 In 2010, it invested in a Kinetic K5000, a machine that can use either a Plasma beam to cut metal plates up to 60mm thick or an Oxy torch that can cut up to 250mm thick. The machine also has a 48 horse-power spindle attached, with a 24 position automatic tool changer, allowing the operator to drill, countersink, and tap holes without moving to a different workstation. The machine is computer controlled so the operator sends precise two- or three-dimensional designs to cut, drill, and bevel metal plates. Advanced Profile Solutions invested heavily in the Kinetic K5000 and a custom-built workshop to house it. When the state-of-the-art machine was installed, there were only three machines in Australia, according to Operations Manager Steve Thompson. "It cuts with great accuracy quickly and efficiently," Mr Thompson said. "When engineering firms commission work, they need it straight away. They benefit greatly from our accessibility and personalised service." Advanced Profile Solutions works with its customers to devise innovative solutions. "We're looking for new ways of doing things and ways to refine a project," Mr Thompson said. "It's important to find ways to increase the productivity of our customers' processing plants by increasing their efficiency or reducing their down-time." The ability to redesign components using advanced technology brings significant advantages to existing process designs. "Many of our clients appreciate the additional support we can provide," Mr Thompson said. While based in Broken Hill, the company draws a third of its business from other mining areas including Cobar in NSW, and Roxby Downs and Whyalla in South Australia. Competing with businesses based in Australia's state capitals, Advanced Profile Solutions has fostered employment and industry in Broken Hill. 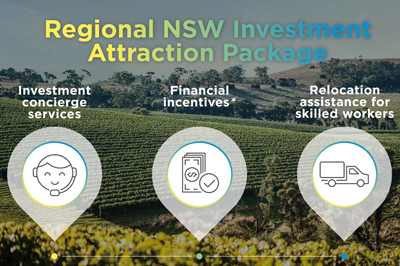 Advanced Profile Solutions received valuable advice from the NSW Government, as well as a grant funding. "The assistance was very helpful when purchasing materials in the initial stages, when we were buying the machine and building the workshop," Mr Thompson said.